Some budget items styled two ways. All the items are under $100 - and most are around $25-50. 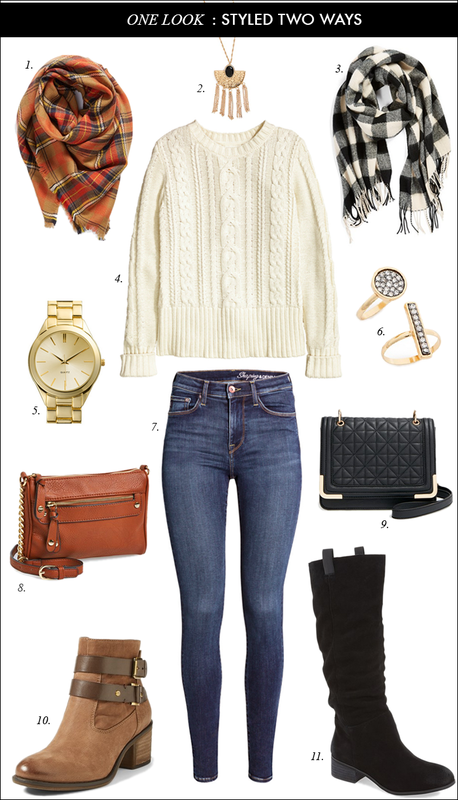 Love this look- especially the creams and plaids. Loving that scarf on the left! I need a cable knit cream sweater! Me, too. I am debating getting it - but I already have a few scarves. Thanks, Amy Ann. This is a perfect demonstration of how I stretch my wardrobe on a daily basis! People are always shocked that I don't own more clothes, and it's because I own a lot of neutrals that I can style different ways. Great style ideas! Thanks, Jacy. I agree - we don't need a lot of clothes - just basics that can you can mix and match. I love cable knit sweaters and wear them all the time. It looks so polished and fall like with jeans and a scarf! I love cable knit sweaters - too. Thanks! I love the short booties with it! Love that you gave these pieces two looks. That plaid scarf is always a great layering piece. Cute look! My favorites are the scarves, they're so prefect for fall!